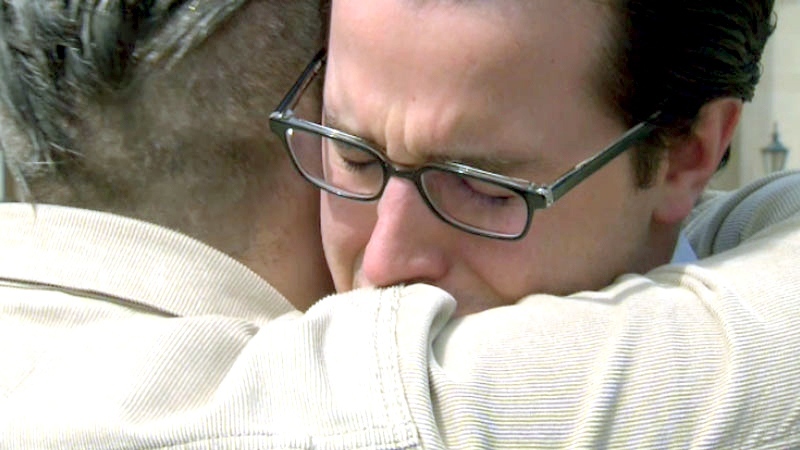 More than a decade after a stranger saved the life of a suicidal teenager in Nova Scotia, the two men met for the first time since their fateful first encounter. When he was 15, Mark Henick stood on the ledge of a bridge in Sydney, N.S. with the intention of jumping. Henick said he remembers everything about that night in 2002: The temperature, the rain on the railing of the overpass, faces in the crowd that began to form. As he stood clinging to the railing, Henick recalls hearing the voice of a man shouting at him to jump, calling him a coward. But as Henick let go of the railing, another person emerged from the crowd, wrapped an arm around his chest and pulled him back. The man didn’t say much, but stood behind Henick to let him know he was there to help. "This image had always stuck in my mind, of having this guy on the sidelines who didn’t know me, who didn’t have any apparent interest in my life or what I was going through, who was basically pushing me over that edge," Henick told CTV’s Canada AM on Friday. "And then I had this other stranger who was right behind me, not really saying a whole lot. Not telling me to do anything, not trying to solve all my problems, and he was the one who was keeping me there, who literally was the one who pulled me back." Henick didn’t jump, and 13 years later, the 27-year-old is working as a mental health advocate in Toronto. 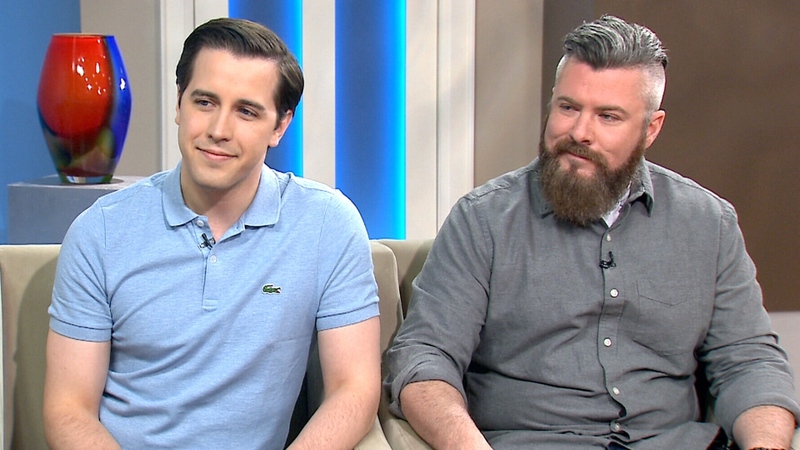 In January, he appeared on CTV’s Canada AM to share his story, saying he still didn’t know the identity of the man whose intervention saved his life. After appearing on the show, Henick took to Twitter to find the stranger. "Just shared on @CTVCanadaAM about a stranger who saved my life on a bridge in Cape Breton in 2002. Can you help me find him?" he wrote. The next day, two people got in touch, telling Henick that the mystery man was also trying to find him. Mike Richey, a budding youth care worker who happened to be driving by when Henick was perched on the bridge railing, now works at a non-profit residential facility for at-risk youth in Halifax. Richey sent Henick a letter, and the two finally met up in Toronto on Thursday. Canada AM was there for the emotional reunion at Toronto City Hall. "Giving him a hug was the best feeling. There was no words," Richey said. Henick introduced Richey to his wife and toddler. "I didn’t even know if Mike was real for most of this time. I didn’t know if he was something I’d just made up in my mind. To see him and to finally have my arms around him again, it was something else." Richey told Henick he was proud of him for what he’d accomplished in the 13 years since they’d seen each other, and said that meeting his family was "awesome." He told Henick what he’d been thinking the night they met: "If you wanted to talk, you can talk. If you want to just stand there, I'll stand right there with you." Richey said he just wanted Henick to know he was there, without making him feel pressured. Henick told Richey he'd changed his life, inspiring him to work for the Ontario division of the Canadian Mental Health Association and join the board of the Mental Health Commission of Canada. "I've been living my whole life trying to be that guy, the one who pulls people back," he said Friday. Henick said he struggled to figure out how to thank the man who saved his life. "I realized that living my life is the best thanks that I can give him. When I look at my wife and I look at my son I realize that I can’t thank him any more than that." Mike Richey and Mark Henick hug while meeting in Toronto 12 years after Richey saved Henick's life, on Thursday, April 30, 2015. Mark Henick and Mike Richey appear on CTV's Canada AM on Friday, May 1, 2015.